Sylius is an exceptional choice of eCommerce platform for small, simple stores that can be developed almost in a blink of an eye, if the blink is a month or two long. At the same time, Sylius is an excellent choice for highly custom online stores where the shopping experience is very different than Magento flow. For example: if you have highly custom products with advanced configurators or if you have fully custom ordering process where there is no shopping cart or standard checkout. Don’t get us wrong, such customizations can also be built with Magento, but it is easier to do so on the lighter platform. Why Sylius as an eCommerce platform? Based on Symfony PHP framework and released under the most permissive MIT licence, Sylius is a fully open source solution on a modern technology stack. Sylius provides essential features necessary for successful growth of your store. It enables easy integrations and allows for unique design of your eCommerce website with the templating system that gives you full freedom to make your store look the way you want. This, combined with the flexibility of the shopping process, allows us to create a truly unique look and feel for your customers. Sylius provides built-in eCommerce APIs, which make it super easy to build native mobile applications (iOS, Android, etc.) and Progressive Web Apps. It also integrates with your existing tech stack. Sylius has been designed with integrations in mind and can connect to external specialized software. CRM, PIM, ERP, mailing, inventory or any other stack, we can connect it to your store. Adaptable admin panel that is constructed from reusable and easy configurable components to adjust for your unique business needs. Sylius can be deployed on the most popular hosting platforms, like Google Cloud, Heroku, Platform.sh and many more. This makes scaling and implementing new features cost you less money & time. Extremely high performance ensured. Sylius comes with out-of-the-box integrations with most of the popular providers. Even if you use an exotic payment processor, it can be added at low development cost. Why choose Inchoo and Sylius for your eCommerce? Take Sylius for a test drive! 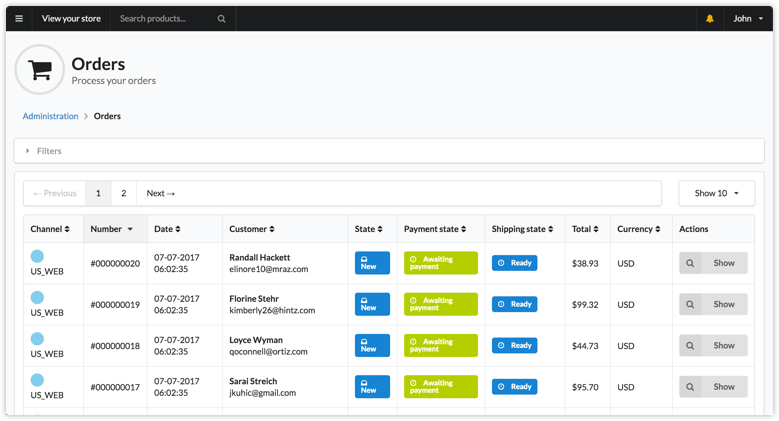 Click through demo Sylius administration panel and a sample B2C shop built on top of the core framework. Let us know what you think of it! We will analyse your business from top to bottom, and whether if it’s an existing store or a new one, we’ll plan the whole creative process with you. Even if Sylius is not a best match for your needs, with joint brainstorming we are sure we can find a solution that is. Small and simple store or highly customized ones that need design, integrations, testing and deployment, we are with you through the whole way. And we are not stopping there! Our mission is to keep your store healthy, stable and always in the loop with the new marketing trends that will increase your online visibility and revenue. Do you need an experienced development partner? We have miles of successful eCommerce experience behind us which enables us to point you in the best possible direction for specific stage you find yourself in right now. Contact us to see what we can do for your business!